De Kloof is a beautiful, restored Cape Dutch National Monument; it is the historical gem of Swellendam. 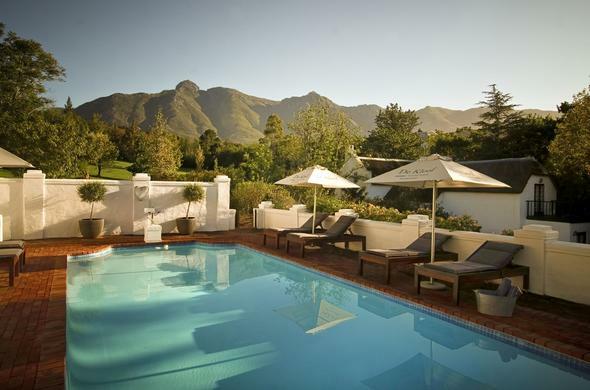 De Kloof is a luxury, restored Cape Dutch gem and National Monument dating back to 1801, on a tranquil estate set in large well established gardens abundant with birdlife. De Kloof is a stylish blend of historical elements and modern design that merges a modern classic European style with a selection of African and Asian art, fabrics and artefacts. The library, cigar lounge and a complimentary wine tasting is available at the entertainment area, at this Western Cape guest house accommodation with breathtaking views. A golf putting green and driving range are on the estate adjoining the nature reserve. The owners come from the hotel industry and specialize in event management such as receptions, weddings and upmarket team building groups. The estate can be booked for several functions. Dutch, English, German and Swedish are spoken for your convenience.